As long as you don't need to alter your reference pitch from A-440, this remains the best pedal tuner available. Brighter display. Same simultaneous tuning. Strobe mode accuracy. Existing users should probably skip the upgrade. 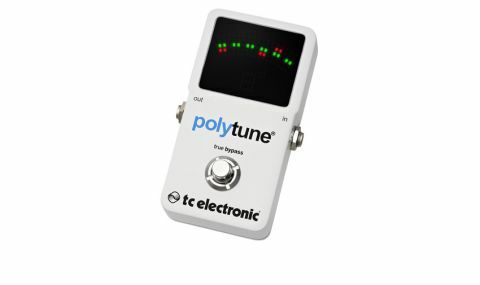 It's fair to say that the introduction of TC Electronic's polyphonic PolyTune pedal tuner in 2010 gave the often-dowdy tuner market a kick. "The big news for version 2 is a much brighter display, which means you can actually see what's going on for outdoor gigs on a sunny day"
It wasn't just the fact that it was a true bypass, highly accurate tuner that allowed you to see all six strings simultaneously, and which ones were sharp, flat or in tune, but it also drop-tuned to B and capo-tuned up to the 7th fret (B-B). Then there was the clear, bright LED Matrix display, and a nine-volt DC output to power other pedals. The big news for version 2 is a much brighter display, which means you can actually see what's going on for outdoor gigs on a sunny day. An auto-sensing light feature also stops you needing to wear shades when you tune in more normal situations. Then there's a new ultra-accurate strobe display mode that tunes to 0.1 cent accuracy: perfect for setting your intonation. You can access the different modes and tunings via two push buttons on the top side of the pedal. Once set, the unit remembers your configuration, even when you switch the power off. The strobe function is extremely accurate - the only downside being that now we'll all know just how 'out of tune' our instruments are. If you don't gig outdoors or want to do instrument setups, then you probably don't need this new version. But if you haven't already enjoyed the PolyTune's intuitive and fast tuning, this new version is even better still.